Trivia: The hotel where the three stories converge is no longer standing, so many fans of the movie have made pilgrimages to the site only to find that it no longer exists. Mystery Train is my favorite Jim Jarmusch film. I enjoy everything about this offbeat little movie, from the way it skillfully ties its three-part story together, to its down and dirty depiction of Memphis, long considered the birthplace of Rock and Blues music, yet presented here in a way it's never been seen before. This is not the Memphis made popular by Elvis Presley, Roy Orbison or Sun Records. In Mystery Train, we visit areas of the city its Tourism Council would sooner forget exist. Named after a popular Elvis Presley song, Mystery Train relates three separate Memphis experiences. Jun (Masatoshi Nagase) and Mitsuko (Youki Kudoh) have just arrived from Japan, armed with both an extensive knowledge of Rock Music and a burning desire to see where Elvis got his start. They're young and optimistic, and aren’t the least bit discouraged by the fact they don't speak a word of English. Luisa (Nicolette Braschi) just flew in from Italy to claim her late husband's remains. She ends up sharing a motel room with Dee Dee (Elizabeth Bracco), an energetic young woman who recently walked out on her husband, Johnny (Joe Strummer). Nicknamed “Elvis” because of his resemblance to the King, Johnny is mired in a deep depression. Aside from losing Dee Dee, he was also laid off from his job, and both his friend, Will (Rick Aviles), and brother-in-law, Charlie (Steve Buscemi), do their best to help Johnny snap out of his funk. As luck would have it, all of these characters check into the same motel for the night, a third-rate joint with a portrait of Elvis in every room. Even in this rundown area of town, the spirit of Elvis Presley lives, and that spirit will touch the lives of some of them before the night is out. In a 1984 interview with Film Comment magazine, Jarmusch said he was fond of what he termed the ‘post-industrial landscape’, believing a study of urban decay evokes a natural sadness while, at the same time, creating something quite beautiful. In Mystery Train, we go “off the beaten path”, away from Memphis' various tourist attractions. As Jun and Mitsuko make their way to Sun Studios, they pass dilapidated houses, abandoned storefronts and walls decorated with graffiti. When Luisa leaves an all-night diner, two shady men, one of whom just bilked her out of twenty dollars, follow her. Johnny, depressed over losing his woman and his job in the same day, gets drunk at a local bar, the kind of place where you feel a fight's always about to break out. This is the Memphis Jim Jarmusch chose to explore, the Memphis that fascinated him, and the enthusiasm he showed for this neglected corner of town was catching; I, too, was captivated by it. Mystery Train has everything you'd expect to find in a Jim Jarmusch film: the subtle humor, the urban setting, and characters that exude a genuine innocence. It has all this, and even throws in a visit from Elvis’ ghost for good measure. But the King’s apparition doesn’t hang around very long. Late at night, in one of the motel rooms, the spirit of Elvis materializes out of thin air, looks around and says, “Sorry, I must be in the wrong place”. Yes, ladies and gentlemen, as amazing as it may sound, not even Elvis Presley recognized Jim Jarmusch’s Memphis! Not my favorite Jarmusch (which would probably be Down by Law, or maybe Dead Man, or even possibly Ghost Dog -- actually, most of his films would be a good choice), but I can see why people make that pilgrimage. In addition to all the things you described, let's also mention the great byplay between the desk clerk and his assistant ("You gonna eat that plum?"). Great performances by Screamin' Jay Hawkins and Cinque Lee. Anthony: Thanks for the comment! I'm a fan of all those Jarmusch movies you mentioned (especially DEAD MAN). and thank you for bringing up the give-and-take between Screamin' Jay Hawkins and Cinqué Lee...it was a definite plus! I don't know why the links you posted didn't create a hyperlink, but I recommend everyone copy and paste them into their browsers, and check them out. Wonderful, as always! 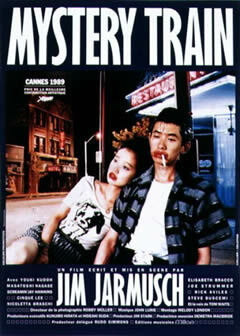 Not my favorite Jarmusch but would definitely be high up on the list, probably 3rd behind Night On Earth and Dead Man. The 2nd of the 3 sequences has never really grabbed me for some reason but 1 and 3 are so good (especially 1) it's still a pleasure to watch this straight through, a wonderful work of art.